Pierre Schoendoerffer, the Sentinel of Memory is the first feature length documentary about French writer and filmmaker Pierre Schoendoerffer directed by Raphael Millet in 2011. 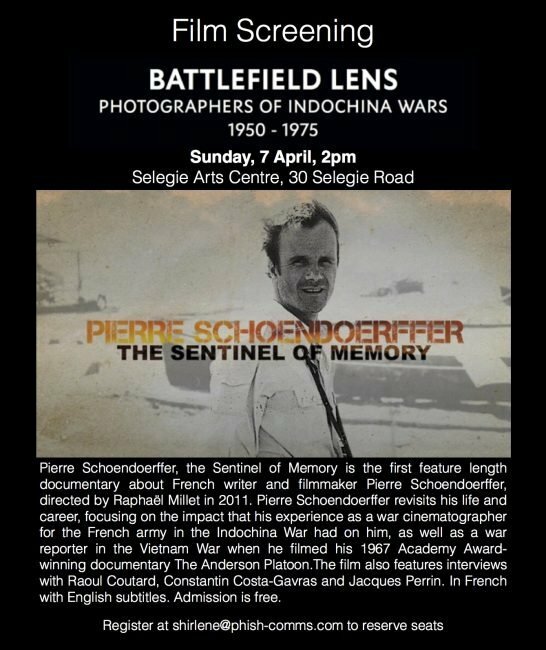 Pierre Schoendoerffer revisits his life and career, focusing on the impact that his experience as a war cinematographer or the French army in the Indochina War had on him, as well as a war reporter in the Vietnam War when he filmed his 1967 Academy Award winning documentary the Anderson Platoon. The film also features interviews with Raoul Coutard, Constantin Costa-Gavras and Jacques Perrin. In French with English subtitles. Venue: Selegie Arts Centre, 30 Selegie Road. Admission is free. Places are limited, please register at Shirlene@phish-comms.com to reserve seats now!